Copenhagenize.com - Bicycle Urbanism by Design: Oslo - The Next Big Bicycle Thing? Oslo - The Next Big Bicycle Thing? This is a translated version of an interview with Mikael published in the Norwegian newspaper Morgenbladet on 29 April 2016 by journalist Marius Lien. The photo used in the article is by Christian Belgaux. Oslo - one of Europe’s best bicycle cities? It sounds like a joke. But according to the Danish urban designer, Mikael Colville-Andersen, everything is in place for Oslo becoming the next great bicycle city. He should know what he is talking about. As head of the Danish consulting company Copenhagenize Design Co., he has travelled over the past nine years from one global city to the next to share his knowledge with urban planners and politicians. Recently, he has spent a lot of time in Norway since he got a Norwegian girlfriend, and he tosses around anecdotes and bicycle urbanism experiments from every corner of the planet. 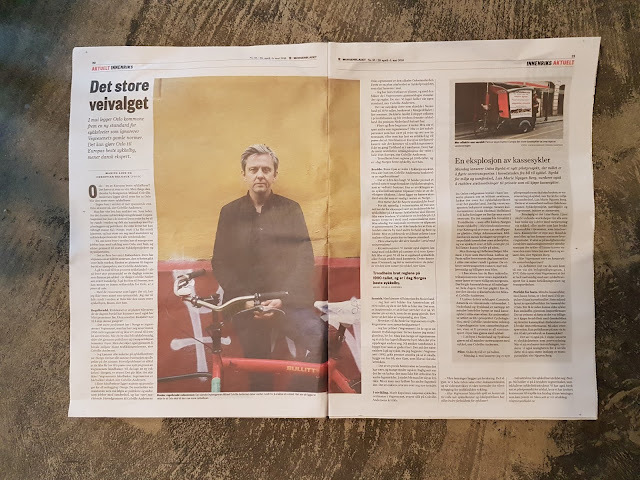 “Few, if any, cities in the world have so many people working with cycling as Oslo does”, he says, and focuses primarily on Sykkelprojsektet (The Bicycle Agency) and the City Environment Department (Bymiljøetaten). “There are more here than in Copenhagen. You have a vision for a car-free city centre and that news travelled around the world. The rest of the plans from the city council are great, too”, says Colville-Andersen. To go from 0% to 5% modal share for bikes is, according to Colville-Andersen, the most difficult challenge. To go from 5% to 15% - something he believes is within reach for Oslo - is a piece of cake. “With the resources that are available there now, I can’t be anything but optimistic. I tell people around the world that Oslo will become the next big bicycle city. Boom”, he says. The problem is that the plans the city council have proposed have also be proposed before. Without result. Will anything happen this time? “The main problem here in Norway is the engineers at the National Road Directorate (Statens Vegvesen), who have learned 1950s, American traffic engineering and who aren’t capable of thinking differently. When a city wants to become bike friendly, the politicians and transport department have to make it happen. But it also has to happen through a liberal traffic engineering environment”, says Colville-Andersen. “I know the heads of most city bicycle offices in Norway. They share the same frustrations and they point their finger in the same direction. The primary problem is that they are never allowed to try anything new because of the Road Directorate’s guidebooks. If you want to make a new cycle track in Bergen, the answer is: ‘Nope, it’s not in our guidebooks. The engineers are the spanners in the works”, says Colville-Andersen. These guidebooks contain all the rules for traffic planning in Norway. They highlight the road standards that politicians and others working with traffic must adhere to and they are unmovable. The main reason for Colville-Andersen’s Oslo optimism is the so-called Oslo Standard. A plan developed by the Bicycle Agency, which will be launched in May. “I have seen the plan and it completely ignores the old-fashioned standards and rules upheld by the Road Directorate. They say: ‘We’d rather make our own standard’”, says Colville-Andersen. It was exactly the same in the Netherlands in the 1970s, as described in Morgenbladet last summer. The country managed to stop the growth of private car ownership and become the most advanced bicycle nation in the world. A position they still maintain. “More and more people are thinking: What if we ask someone else? Instead of the engineers? It’s often individuals who have been on holiday and seen something interesting, or who have read an article and want to try something out. Norway is the USA of Europe when it comes to traffic engineering. Not even Germany comes close. You have the most restrictive guidelines for roads in all of Western Europe”, says Colville-Andersen. “Trondheim broke the rules in the 1990s and is now Norway’s best bicycle city”, he says. Rune Gjøs is the head of the Bicycle Agency (Sykkelprojsektet). What does he say about Colville-Andersen’s description of the rule breaking? “It may be a stretch. We focus on work that is heavily anchored in the Bicycle Strategy that the city council has passed. The development of bicycle infrastructure adapted to Oslo is one of the most important parts. It is a higher standard than is normal in the rest of Norway”. What do you mean? A higher standard for what? “For everything, really. In the current road standards the maximum width for a bike lane is 1.8 metres. They can’t be wider. We have established a width of 2.2 metres. This goes against the standards but it’s not illegal. The national standards are adapted to an average. They don’t take into consideration that Oslo is the country’s largest city, with different conditions and more cyclists. A lot of our work is finding out where in the established guide we can put a higher standard in”. Do you have more examples of how you work against the road standards? “Intersections. We don’t think that the current solution with the bike lane on the same level as the car lane is good. We want a raised cycle track or a physical separation with a curb. That’s what you find in Denmark and it is mainstream in parts of the world that are banking on bicycles”, says Gjøs. He knows the story from the Netherlands. “I have seen photos from Amsterdam in the 1970s and it is full of cars. It is inspiring that they were once in the same situation as we are now. We’re starting from scratch, like they did. It means it isn’t unattainable”, says Gjøs. How would you describe the traffic engineers in the Road Directorate as partners? “I worked in the Road Directorate for 16 years and I’m educated as a traffic engineer. So I’m throwing rocks in a glass house, haha. You can give them the blame and say that they created car-centric cities. But now the external assignment has changed. Now society wants to build cities that are good to live in. It has to be easier to walk or cycle. When I started in the Road Directorate in 1992, the pressure was on to build roads for cars”, says Gjøs, who nevertheless understands the criticism. “It is a precise description of how it was and how it still is in many places. On a professional level, it is a culture that wasn’t used to being challenged by other professions. The criticism hurt a little. Now there is a willingness to listen to other professions. It’s easier to adapt to new trends”. “Our solutions are based on research. We constantly look for documentation and then further develop our standards for safe traffic designs for cycling”. Has the Road Directorate historically played a constructive role when bicycle offices and politicians want to improve the conditions for cyclists? “Infrastructure for bicycles has developed in Norway. We are currently revising our road standards, which include bicycle infrastructure. We have also started a pilot project for bikes, where we have invited cities to provide ideas we can test. We are, I suppose, in development”.